This article is about the London Underground station in Cassiobury, Watford. For the tube station proposed in 1927 that was never built, see Watford Central tube station. For other stations in Watford, see Watford station. Watford tube station is the terminus of a Metropolitan line branch line in the north-western part of London Underground in Zone 7. The station opened in 1925. The station is in the Cassiobury area, on Cassiobury Park Avenue at the junction with Metropolitan Station Approach, close to two of the entrances to Cassiobury Park. It is approximately 1 mile (1.6 km) from the town centre, which is more immediately served by Watford High Street and Watford Junction stations. The station building was designed by the Metropolitan Railway's architect Charles Walter Clark in an Arts and Crafts vernacular style. It is in red brick with a clay-tiled hipped roof, tall brick chimney stacks, and timber sash and casement windows. The main entrance is covered by a polygonal metal canopy supported by twin Doric columns, and the interior, mostly unaltered from the original, is decorated with period tiling and hardwood panelling. The station building is grade II listed. According to data compiled in 2010, it is the 25th-least used station on the London Underground. 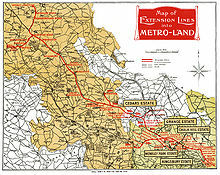 In the early 20th century, the Metropolitan Railway (MR) penetrated Hertfordshire and Buckinghamshire with its suburban railway, enticing Londoners with its "Metro-Land" advertising campaign promoting the new railway as an opportunity to live in a rural location with easy transport to central London. The MR was also intent on providing a connection from Watford and planned a branch line from Moor Park via Croxley. The MR purchased a swathe of land from Gonville and Caius College, Cambridge along the planned route, and Parliamentary approval for the branch was granted in 1912. The project was hampered by disagreements with the Watford Borough Council and by the outbreak of World War I in 1914, and construction of the 2.5-mile (4.0 km) branch did not begin until 1922. The MR experienced difficulties running the line across the River Gade and the Grand Junction Canal, and this pushed costs up to £300,000. Watford Met station opened on 2 November 1925, with MR electric trains to Baker Street and LNER steam trains to Marylebone for the first few months. The Watford Observer commented on the opening that the new station was "likely to have a much greater effect on the town than is at present realised. Just as trade follows the flag, so population follows the railway". Posters published by the MR in 1925 promoting the new route "by Metro to Watford" depicted Watford High Street on market day, belying the remote location of the station. For many years, the MR operated a bus service from the High Street in an effort to gain more passengers, but contrary to the Watford Observer's predictions patronage remained low. MR passenger numbers compared unfavourably with services into central London offered by the LMS and the UERL Bakerloo line from Watford Junction and Watford High Street, and after the General Strike of 1926 the LNER pulled out of the venture with the MR.
Watford tube station in Cassiobury Park Avenue was not originally planned to be the terminus of the Watford branch. The Metropolitan Railway Company's original plans drawn up in 1912 intended the line to continue through Cassiobury Park and beyond to Hempstead Road on an area known locally as 'The Wilderness', where West Herts College would later be built (opened in 1938). Watford Council had recently bought part of the Cassiobury Estate and objected to the proposed railway through the town park and recreation gardens, and so the last section of the route was removed and the line would end abruptly in Cassiobury Park Avenue instead. Work began in 1922 with the Watford branch opening in 1925. An opportunity arose in 1927 for another route to extend the line into the centre of Watford. Through a third party, the Metropolitan was able to purchase an existing building at 44 Watford High Street together with two-and-a-half acres of backlands, with the intention of creating a Watford Central terminus in the town centre. The possibility of a single-track extension in tunnel—either from the existing station or following a diversionary route around the station—was explored, but costs were extremely high and no Parliamentary powers were sought. The High Street building was leased out and was eventually disposed of by London Transport in 1936, and today Watford Met station remains the terminus of the line, approximately 1 mile (1.6 km) from the town centre. When Travelcard zones were introduced in 1984 by London Regional Transport, the station was in Zone B; in 2004 it moved to Zone A, and in 2008 to Zone 7. The ambition to extend the Metropolitan line into Watford town centre was revived around 1994 by London Regional Transport (LRT) when proposals were put forward to run the line to Watford Junction. The projected route was shown on an adapted version of the Tube map for internal planning purposes printed in that year. This project, known as the Croxley Rail Link, involved connecting the Metropolitan line to the disused Watford and Rickmansworth Railway line and reinstating the Croxley Green branch to Watford High Street. The line, opened in 1912, had been closed by British Rail in 1996 owing to low passenger numbers. Although it ran very close to the Metropolitan line (at its closest point about 200 metres away), the two lines were never linked. The plan was to connect the two lines via a short viaduct. The Croxley Rail Link project would have resulted in the closure of Watford Met station. On 14 December 2011 the project was given approval by the Department for Transport at an expected cost of £115.9m with a proposed completion date of January 2016, later revised to 2020. The planned closure of Watford Met station met with some local opposition, and campaigners lobbied for the station to remain open with a reduced shuttle service. A report compiled in 2012 by the transport watchdog London TravelWatch concluded that the opening of new stations on the route would mitigate any inconvenience caused by the closure, and that a minority of passengers would experience an increase in journey times of more than 15 minutes. It also recommended that a shuttle train service should be trialled, and that in the event of closure a bus service should be provided from Cassiobury to one of the new stations. As of December 2011[update] the typical off-peak service was four trains per hour to Baker Street off-peak, with a limited service to Aldgate at peak times. Wikimedia Commons has media related to Watford tube station. ^ Hardy, Brian, ed. (March 2011). "How it used to be - freight on The Underground 50 years ago". Underground News. London Underground Railway Society (591): 175–183. ISSN 0306-8617. ^ "Watford Station, Watford". British Listed Buildings. Archived from the original on 25 January 2014. ^ "The proposed closure and discontinuance of services to and from Watford station". London Travel Watch. 28 August 2012. p. 7. Archived from the original on 25 January 2014. ^ "Metro-Land". British Empire Exhibition booklet. South Bank Publishing. 1924. ^ a b c d e Wolmar, Christian (2009). The Subterranean Railway How the London Underground Was Built and How it Changed the City Forever. London: Atlantic Books Ltd. ISBN 9781848872530. ^ Unknown Artist (1925). "By 'Metro' to Watford". London Transport Museum poster collection. London Transport Museum. Archived from the original on 9 August 2013. ^ Unknown photographer (1927). "Inventory no: 1999/28830 - Photograph of Metropolitan Railway single deck coach outside Watford MR station". London Transport Museum photographic collection. London Transport Museum. Archived from the original on 9 August 2013. ^ Horne 2003, p. 40. ^ Jackson, Alan A. (December 1961). Cooke, B.W.C. (ed.). "The Metropolitan Railway at Watford". The Railway Magazine. Vol. 107 no. 728. Westminster: Tothill Press. pp. 821–3, 825–8. ^ Horne 2003, p. 39. ^ Horne 2003, p. 96. ^ Garland, Ken (5 December 1994). Mr Beck's Underground Map. Harrow Weald: Capital Transport Publishing. p. 63. ISBN 1-85414-168-6. OCLC 32915967. ^ "Survey works to start along Croxley Rail Link route". Croxley Rail Link. 29 July 2013. Archived from the original on 2 September 2013. ^ Wright, Mike (24 July 2013). "Watford Met Station to close to passengers when new Croxley Rail Link opens". Watford Observer. Archived from the original on 11 August 2013. ^ "Local Authority Majors - Development Pool Schemes - Scheme Decisions" (PDF). DfT. December 2011. Archived from the original (PDF) on 25 April 2012. ^ "Croxley Rail Link update". 17 December 2014. Archived from the original on 9 January 2014. ^ Michael Knowles (30 July 2015). "Croxley Rail Link will not be completed until 2020, documents reveal". Watford Observer. Retrieved 11 September 2016. ^ Stops, Vincent (25 September 2012). "Transport Services Committee Secretariat memorandum: Watford station closure proposal". London TravelWatch. Archived from the original on 5 October 2013. ^ Duggan, Emma (25 January 2017). "UPDATE: Met Line extension: Mayor confirms work has stopped". Watford Observer. Retrieved 3 October 2018. ^ "Watford Tube Guide" (PDF). TfL. Archived (PDF) from the original on 12 January 2012. Horne, Mike (2003). The Metropolitan Line: an Illustrated History. Capital Transport Publishing. ISBN 1854142755. This page was last edited on 24 April 2019, at 19:03 (UTC).